The stainless steel plaque commemorates John McDouall Stuart and his companions who passed through the region in 1862. It also acknowledges the Aboriginal tribes indigenous to the area who met from time to time, for ceremonies around Newcastle Creek and Lake Woods. The plaque was unveiled in 2012, to commemorate the 150th anniversary of their expedition. The plaque was designed, constructed and installed by Peter Jones on behalf of the Barkly Shire Council and the J McDouall Stuart Society. 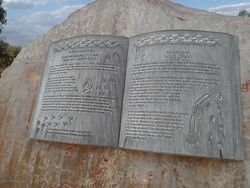 The plaque is in the form of an open book. Stuart discovered the local waters on 23 May 1861, during his 5th expedition. He named them Glandfield Lagoon, but the name was later changed to Newcastle Water to honour the Duke of Newcastle, Secretary of State for the Colonies. Stuart and his companions then passed through the district in 1862, on his 6th expedition. They became the first Europeans to cross the continent from south to north through the centre, returning without loss of life. As a consequence of Stuart`s explorations, the riddle of the geographical nature of the centre of Australia was solved. Control of the Northern Territory was passed to South Australia. South Australia established settlement on the north coast at Darwin and various areas were opened up for pastoral and mineral development. The Overland Telegraph Line linking Adelaide to the world via Darwin, was constructed along his route. 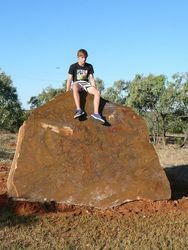 Erected by the Barkly Shire Council and the John McDouall Stuart Society in April 2012. The lands surrounding Newcastle Waters and the catchment areas of Newcastle Creek are where the shared boundaries of Mudbura from the west and the Jingili Aboriginal people from the east intertwine. A land given to them by the Dreamtime spirit ancestors. The Mudbura called this area Marlinja. It is well favoured country, an oasis in a dry land. Beyond, in more arid areas, live related people: the Wambaya to the east and south-east; the Yangman and Mangarrayi to the north; the Gurindji to the West, the Warlmanpa, Warumungu and Warlpiri, to the south and south-west. These people all had traditional associations with the Mudbura and Jingili people and the spiritual ties to the well-watered areas around Elliott. It was a centre of activity which they made the best of according to the prescriptions of their Dreamtime lore, which required them to care for the land by proper performance of ritual and ceremony. From time to time, all the people of this region would assemble for large ceremonies that were held around Newcastle Creek and Lake Woods.